The book looks at various effects of globalization on Nuer society such as changes in their social structure and the creation of a strong desire to counter their societies’ marginalization. It is based on a multi-sited ethnography following the people from Funyido refugee camp in Gambella/Ethiopia and adjacent villages in the Ethio-Sudanese borderlands to Des Moines/Iowa in the US, and back to the borderlands. 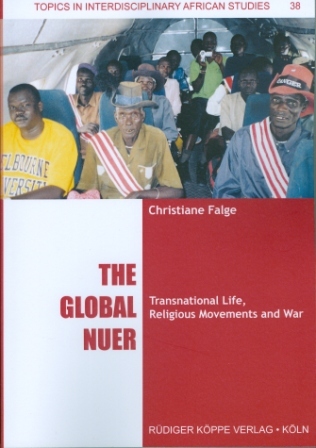 While the books’ particular focus is on the transnational linkages created through US based churches built up in the homeland by Nuer missionaries, it also contains case studies from other social, political and military fields. The ethnography reveals how individual agency in these institutions striving for leadership and power and the search for advancement and modernity follows patterns familiar from the lineage structure. The outcome of these practices are processes of fission that dramatically endanger collective cohesion and advance further marginalization for the Nuer. 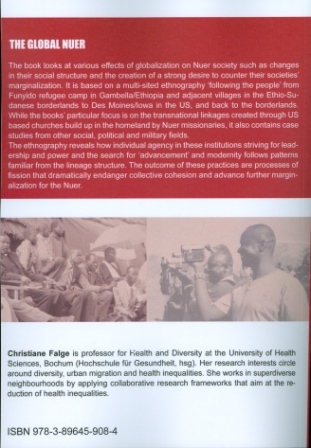 Christiane Falge is professor for Health and Diversity at the University of Health Sciences, Bochum/Germany (Hochschule für Gesundheit, hsg). Her research interests circle around diversity, urban migration and health inequalities. She works in superdiverse neighborhoods by applying collaborative research frameworks that aim at the reduction of health inequalities.